Tiny Tim may have buried the ukulele 6 feet under a bed of tulips, but this wonderful and fun instrument has more than just tip- toed into mainstream consciousness. Popular musicians such as John Mayer, Colbie Caillat, Jason Mraz, Johnny Rzeknik, Taylor Swift and Jack Johnson have incorporated the ukulele in a number of their compositions. It may be small in size but the ukulele opens up the creative possibilities in music. It’s the perfect instrument to bring on the beach or on a long road trip. And even if you play Metallica’s “Blackened” on the ukulele, your neighbors won’t complain! Like the acoustic guitar, the type of wood will have an effect on the tone of the ukulele. The traditional ukulele was made on 1 type of wood for all elements of its sound box meaning its top, bottom and sides. By contrast, the modern ukulele is made of a type of soft wood at the top and hard wood for the bottom and sides. The idea behind the re-design was that soft wood resonates better while hard wood functions as a good reflector of sound within its chambers. Koa is the tone wood used for traditional ukuleles and continues to be the popular choice for hard wood. Mahogany with its density and tonal properties is a close second. As for soft wood, there are many good ones such as cedar, spruce and rosewood. You will not go wrong with any of them. Your choice of tone wood would depend on which brand delivers the sound you want and of course, your budget. Not all ukuleles are the same. There are 4 types of ukuleles and each one will produce a different tone and levels of volume. Soprano – This is the smallest and most popular type of ukulele. It is noted for its crisp tonal quality. Concert – Slightly bigger than the Soprano with a longer neck and wider spaced frets. Some people find the Concert ukulele easier to play than the Soprano. Tenor – Professional musicians tend to favor the Tenor because it produces a low end sound that gives some thickness to its tone. Players have described its tone as similar to that of a classical guitar. Baritone – This type of ukulele is closer to the sound and size of a classical guitar. The Baritone is definitely not recommended for beginners. There are many incredible manufacturers of ukuleles in the market; it was really difficult to select the best brands for our list. Ultimately, we chose the brands which carried ukuleles for beginners, received the most favorable reviews and offered a wide range of pricing to meet your budget. This California- based company has been making high quality ukuleles for the last 10 years. The Kala KA-15S features an all-mahogany construction. Players love it for its crisp, balanced and consistent tone. Best of all, it is very affordable. If you’re thinking of learning how to play the ukulele, the Kala KA-15S should be on the top of your list. Click here to read reviews and pricing on the Kala KA-15S. If you’re interested in a Concert ukulele, the Kala KA-C would be a great choice. It has a mahogany body which ensures you amazing sound and exquisite textures. Those who have played the Kala KA-C find it incredibly well-balanced. As a Concert ukulele, it is more expensive than the Kala KA-15S. But if you want a traditional sounding ukulele that is durable and sturdy, this is the brand for you. Click here to read reviews and pricing on the Kala KA-C. Located in the Hawaiian island of Oahu, Lanikai is a company that best represents the spirit and tradition of the ukulele. That is why their motto is “Makes Me Happy”! The Lanikai LU-21 is a Soprano ukulele which features all nato construction. This approach is quite unusual but nonetheless has given this ukulele a wonderful and pleasant sound. The Lanikai LU-21 is an affordable ukulele with outstanding craftsmanship and awesome tone. Click here to read reviews and pricing on the Lanikai LU-21. This is the Concert version of the Lanikai LU-21. Thus it is slightly bigger, longer and has wider fret spaces. As a Concert ukulele, the Lanikai LU-21C has greater resonance and produces louder volume. Players have argued the Lanikai LU-21C can stand toe-to-toe with the more expensive brands of Concert ukuleles. The fact that it is very affordable gives the Lanikai LU-21C greater value. Click here to read reviews and pricing on the Lanikai LU-21C. Mahalo is perhaps the most popular brand for beginners. In fact, Mahalo is widely considered the top brand of ukuleles for the beginner segment. Its Mahalo MK1TBR may look simple and unassuming. But underneath its exterior is an instrument which offers top end playability and exceptional tone. It has a durable build, good level of craftsmanship and is one of the most affordable Soprano ukuleles in our list. Click here to read reviews and pricing on the Mahalo MK1TBR Kahiko Series. The Mahalo Hano Series is a beautiful Concert ukulele which is made of Segnon, a unique choice of tone wood. It is one of the most playable Concert ukuleles you can get your hands on and is well-balanced in construction and in tone. Excellent craftsmanship, fantastic tone and one of the most affordable Concert ukuleles you can find in the market equates to great value for money. Click here to read reviews and pricing on the Mahalo Hano Series MH-2. Cordoba is renowned for its line of classical guitars. But over the years, the company has continued to produce some of the best high- end ukuleles in the market. The Cordoba 22C was designed to reflect the notable features of its classical guitars into the ukulele. Its top is made of solid spruce with Indian rosewood on the bottom and sides. This ukulele produces a warm, full sound and is more ideal for mid-level players. Click here to read reviews and pricing on the Cordoba 22C. The Oscar Schmidt OU5 series is the perfect ukulele for intermediate players. It is made of laminated Koa wood which makes it light and more affordable than the full-bodied version without compromising its mellow yet bright sound. The OU5 comes with Grover tuners and the company has thrown in a lifetime warranty. How’s that for added value? Click here to read reviews and pricing on the Oscar Schmidt OU5. Fender has long been regarded as one of the finest manufacturers of electric guitars. But the company has made significant inroads in the ukulele market. The Mino’Aka which means “Smile” in Hawaiian, is all Mahogany but includes a tone bar bracing to add a bit of sweetness to its rich, crisp tone. Adding the iconic headstock of the Telecaster further stamps this ukulele as a premium grade instrument. Click here to read reviews and pricing on the Fender Concert Ukulele “Mino’Aka”. Now if you have the big bucks, look no further than the Martin C1K. Martin is among the most recognized names in acoustic and classical guitars. You’ll be hard pressed not to find a guitar icon who doesn’t own a Martin. The C1K has a solid Hawaiian Koa top, bottom and sides. It has great resonance, a warm tone and it feels thick, sturdy and durable. Click here to read review and pricing on the Martin C1K. Golden Gate GP-7 – Ergonomically designed for comfort. Fender Clip-On Tuner FT-004 – Small, compact design with swivel clamp. Mugig Instrument Tuner – 3-in-1 feature: tuner, metronome and tone generator. Planet Waves PW-CP-12 NS Ukulele Capo Pro – Micrometer tension allows for buzz-free and in tune performance. String House CUC02 Trigger Style Ukulele Capo with Pouch – Made of super-light aviation quality aluminum alloy. 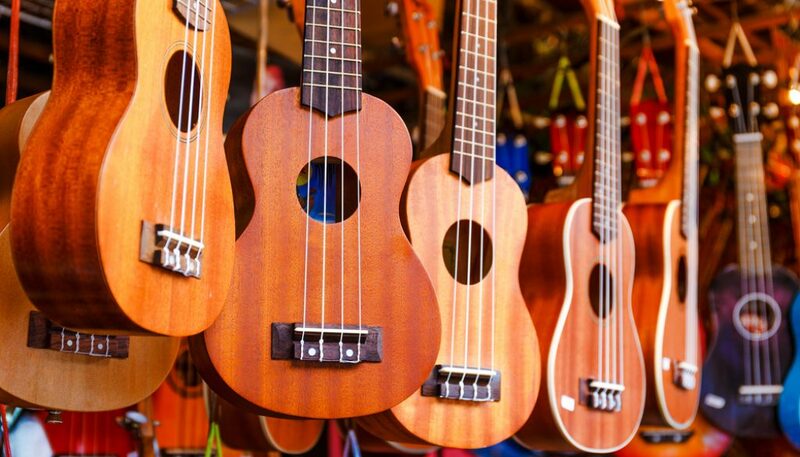 Which Ukulele is For You? As previously mentioned, your choice of ukulele will come down to your budget. How much are you willing to pay for a ukulele? Also, you should know why you want to learn the ukulele. Are you a professional musician who wants to add a different layer to your songs? Then maybe you should consider a Tenor ukulele. If you want to learn the ukulele as a new skill or for pure fun then a Soprano or Concert should do.